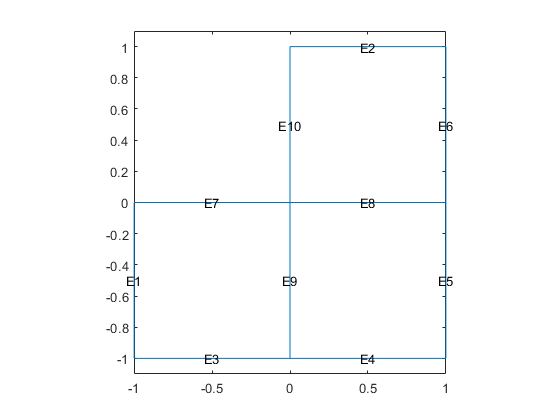 result = solvepde(model) returns the solution to the stationary PDE represented in model. A stationary PDE has the property model.IsTimeDependent = false. That is, the time-derivative coefficients m and d in model.EquationCoefficients must be 0.
result = solvepde(model,tlist) returns the solution to the time-dependent PDE represented in model at the times tlist. At least one time-derivative coefficient m or d in model.EquationCoefficients must be nonzero. Create a PDE model, and include the geometry of the L-shaped membrane. 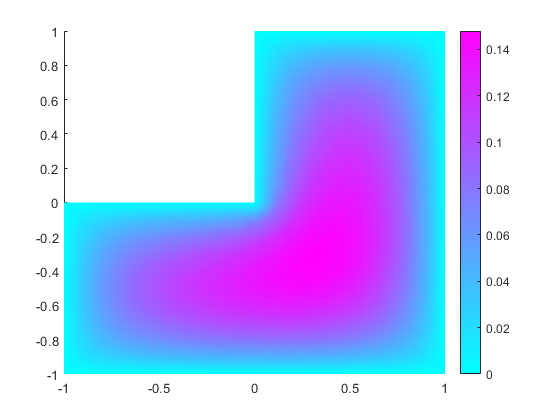 Set zero Dirichlet conditions on all edges. Include the coefficients for Poisson's equation in the model. Mesh the model and solve the PDE. Create a model with 3-D rectangular block geometry. 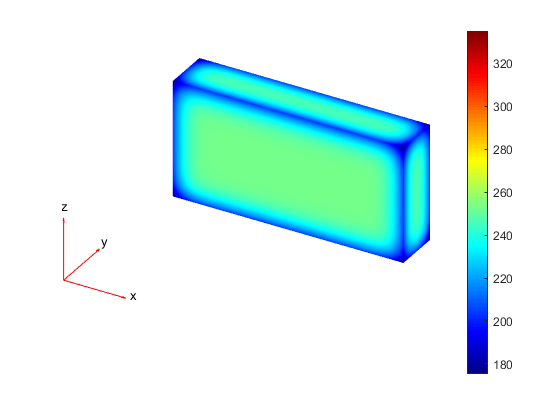 Suppose that radiative cooling causes the solution to decrease as the cube of temperature on the surface of the block. The model coefficients have no source term. The block starts at a constant temperature of 350. Mesh the geometry and solve the model for times 0 through 20. Plot the solution on the surface of the block at times 1 and 20. PDE model, specified as a PDEModel object. The model contains the geometry, mesh, and problem coefficients. Solution times, specified as a real vector. tlist must be a monotone vector (increasing or decreasing). PDE results, returned as a StationaryResults object or as a TimeDependentResults object. The type of result depends on whether model represents a stationary problem (model.IsTimeDependent = false) or a time-dependent problem (model.IsTimeDependent = true). If the Newton iteration does not converge, solvepde displays the error message Too many iterations or Stepsize too small. If the initial guess produces matrices containing NaN or Inf elements, solvepde displays the error message Unsuitable initial guess U0 (default: U0 = 0). If you have very small coefficients, or very small geometric dimensions, solvepde can fail to converge, or can converge to an incorrect solution. In this case, you might obtain better results by scaling the coefficients or geometry dimensions to be of order one.